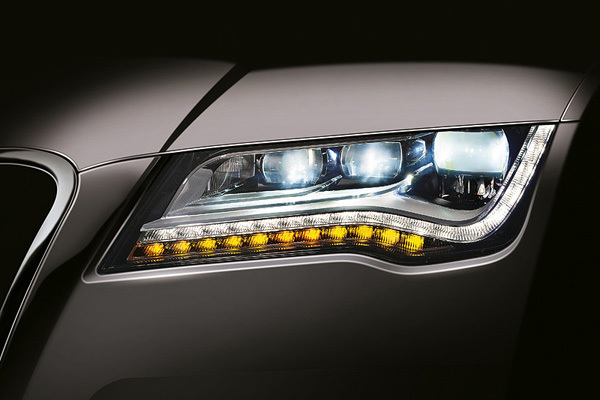 With the development of the Full-LED headlamps, all the functions of mass-produced headlamp were produced for the first time with LED technology (low and high beams, blinkers, sidelights and DRL). LED technology basically stands out for the following characteristics: first of all, a light temperature that is similar to the quality of daylight, an extremely long lifecycle and reduced energy consumption. Moreover, it offers a more effective use of the installation space in the headlamps and ensures greater freedom and variety in defining the styling elements in the field of headlamps. The use of LED technology reduces CO2 emissions into the atmosphere and fuel consumption. This aspect is particularly important with the development of the Daytime Running Light (DRL) system, which needs only 14 W of energy, whereas the consumption of traditional daytime lighting (low beams, rear lights, sidelights) is equal to 300 W. LED technology is gradually evolving, especially in the field of adapting lighting systems and energy consumption optimization.